Designer Maria Grazia Chiuri once again celebrated feminism and sisterhood in her collection for Christian Dior at Paris Fashion Week that delved into the independent styles of the 1950’s Teddy Girls. How to make a bold statement with the logo tee. Need some fresh new ideas for your beautiful face and luscious head of hair? Here are some of the best makeup and hair ideas - spotted at the recent Paris Fashion Week. 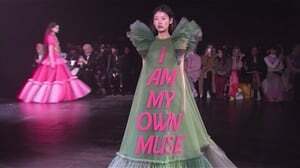 From the creepy to racially insensitive - here are fashion shows that had us scratching our heads. All aboard the Christian Dior express! The cruise 2017 collection setting was magical.